tvN’s ‘On Location Talk Show: Taxi’ will be airing the first episode of ‘NEW Taxi’ with TVXQ as their guest stars. The episode is set to show TVXQ’s Myeongdong outing that paralyzed the streets with fans, as well as the members’ open-minded feelings about dating and marriage, amongst other things. They are planning to openly talk about the difficulties they faced during their 2 year and 3 month absence from Kpop. TVXQ even visited MyeongDong and Eewa Women’s college and spent time with their fans there. There was even a fun challenge where U-Know Yunho and Choikang Changmin had to buy a present with just 10,000 KRW that would surprise and touch the hearts of their girlfriends. Singer IU shows off a ‘3-level expression’ after her ‘3-level octave’, impressing TVXQ’s Max Changmin. 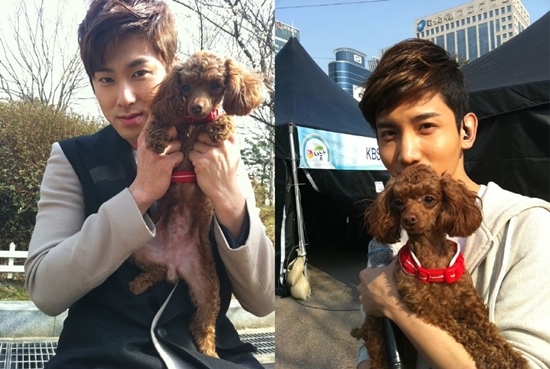 In the April 10 broadcast of SBS ‘Heroes’, the cast took wedding pictures with TVXQ’s U-Know Yunho and Max Changmin. During the broadcast, MC Noh Hong Chul asked Max Changmin before the actual wedding photoshoot, “Which Heroes member do you most want to complete this photoshoot with?” and upon hearing IU’s name, Changmin gave a surprised expression, sending a secret signal to Yunho at the same time. Although Changmin expressed that “I was only shocked (upon hearing her name)”, one could see his inner feelings when he exchanged glances with IU. The cast and TVXQ had to look into each other’s eyes as part of the process of choosing their partners (for the photoshoot). Max Changmin was composed when he looked into the eyes of Seo In Young, Kahi and Shin Bong Sun, but shyly lowered his head in front of IU. IU sent a ‘3-level expression’ to Changmin using her bright eyes, causing Changmin to be unable to look her in the eye. He finally looked down shyly, arousing laughter from everyone. Lee Yeon Hee(23) with her white face and long arms and legs and Shim Changmin(23-stage name Choikang Changmin) with his dark face and tall height. These two, who remind us of characters from melodramatic comic books, recently played the roles of an immature couple in the drama ‘Paradise Meadow’ and received the support and jealousy of fans throughout the series. Married at 19 but divorced six months later, the two meet again after six years and fall in love again. Shim Changmin, who has already risen to fame as Choikang Changmin, a member of the popular idol group TVXQ, made his debut as an actor through this drama. Lee Yeon Hee, who was swept up in controversies surrounding her acting skills, or lack thereof, in the drama ‘East of Eden’, received positive feedback for her take on a completely new and different role. The two youthful stars’ growing pains were deeper than expected. -This was Changmin’s debut as an actor. Lee Yeon Hee – I personally think Changmin’s acting was good. Han Dong Ju, the role Changmin played in the drama, is quite similar to the real Changmin in terms of his character and looks. There were a lot of scenes where he had to yell, and his vocalization was so good that it seemed so natural. -Did Yeon Hee help you as a senior in the acting field? Lee Yeon Hee – His shoulders seemed burdened enough without having me bring the subject up, so I though it would actually put more pressure on Changmin if I approached him first. I tried to make it seem fun while we were filming. Shim Changmin – It was hard because I kept thinking about how the staff members had all eyes focused on me, which is so different from when I sing in a team. I wasn’t able to confess these thoughts to Yeon Hee. Yeon Hee had a lot of lines and had the responsibility of leading the flow of the drama, but she still lead and guided me. -Is there anything you wish you could have fixed? Shim Changmin – I have the kind of personality that does not easily let me feel content with myself and what I’ve done. I can’t forgive even the smallest mistake that I make. I really wanted to do well in the more affectionate scenes, but I don’t think I looked that natural. Lee Yeon Hee – In ‘East of Eden’, I had to act very mature. After that, I was searching for a bright and sunny character and this drama caught my eye. It wasn’t the timid and burdened roles I had played in past movies and dramas. I got to play the role of a determined and clumsy veterinarian who had done anything and everything. I wanted this to be a turning point and an image change in my acting career. I’m content with what I’ve done. -Your fans must be curious of how TVXQ has been after the three members left. Shim Changmin – It’s not easy for two (with U-Know Yunho) people to fill in the space of five people. I feel so much more responsibility now compared to when all I had to do was follow what my hyungs were doing. So I give my all for everything, dancing, singing and the visual aspect. There are times when I feel frustrated and disappointed. Sometimes, I ask myself, ‘After years of performing, I’m still the same, I’ve been doing fine without anything happening, but how did our team become this way?’ Idol singers who debut at a young age own many things people their age usually don’t own, and are faced with many temptations. I think people need to possess the power of discernment and good judgment. -Many female actresses say that they wish to take on a role with many action scenes. Lee Yeon Hee – I watched Soo Ae and Lee Jia act in ‘Athena’, and I thought it was so cool. I exercise every day and build up my stamina, because I might get a chance to play such a role someday. Shim Changmin – They look so frail (he makes an exclamation) but they’re really fit. -What kind of actor, singer do you want to be in the future? Lee Yeon Hee – When I was younger, I watched Natalie Portman in ‘Leon’ and thought, ‘I want to be like her.’ She is my idol and benchmark. She’s an actress I want to take after in all aspects of acting. Shim Changmin – Recently, I met Senior In Sooni. I enjoyed watching her create a passionate performance with difficult and powerful dance moves that are hard, even for younger singers. As this is only my first step in acting, I will do my best.